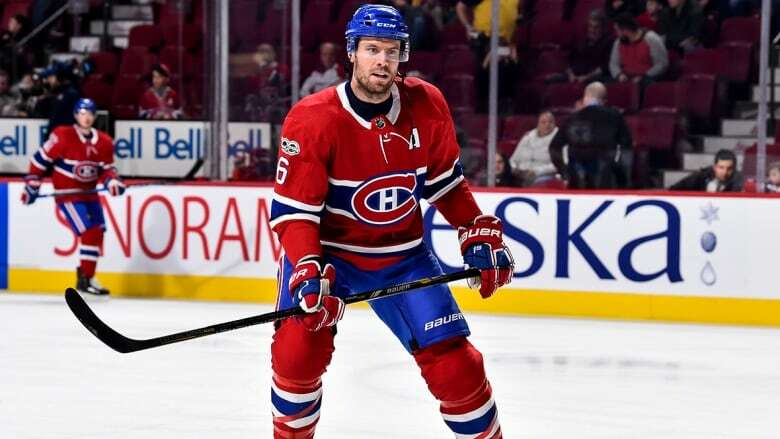 Montreal Canadiens' defenseman Shea Weber will be out for an extended period of time after undergoing arthroscopic knee surgery to repair a meniscal tear in his right knee, according to the team. The recovery period is expected to be five to six months. Montreal Canadiens' defenseman Shea Weber will be out for an extended period of time after undergoing arthroscopic knee surgery to repair a meniscal tear in his right knee, according to the team. The recovery period is expected to be five to six months. Medical update on Shea Weber: The veteran defenseman is out for an extended period of time due to knee surgery.<br><br>DETAILS ➡️ <a href="https://t.co/QDJGyp76Se">https://t.co/QDJGyp76Se</a>. "We were very disappointed to learn that this knee injury will extend Shea's recovery period. Unfortunately, this is out of our control and we have to fully trust the medical group in these situations," Habs general manager Marc Bergevin said. "We are confident that his recovery will go as scheduled and that Shea will return to action as soon as possible." It's the second surgery this year for Weber, who underwent a procedure to repair a torn tendon in his left foot in March. Club surgeon Dr. David Mulder said the damage to Weber's knee was discovered last month after a knee arthroscopy as part of his rehabilitation from foot surgery. Weber, a 32-year-old from Sicamous, B.C., said earlier this year that his foot injury occurred in Montreal's season opener against the Buffalo Sabres. He said he continued to play with the torn tendon until a Dec. 16 outdoor game in Ottawa, when he realized the situation wasn't improving. Weber managed six goals and 10 assists in 26 games despite the injury. Weber was acquired by Montreal on June 29, 2016, in a trade that sent popular defenceman P.K. Subban to the Nashville Predators. The veteran rearguard has 189 goals, 312 assists and 620 penalty minutes over 13 seasons with Nashville and Montreal.